I. Solving the issues on the island of Ireland through the future relationship. This future relationship would need to avoid a hard border, and protect North-South cooperation and the Good Friday Agreement. Once again, ladies and gentlemen, it is important to tell the truth. A UK decision to leave the Single Market and the Customs Union would make border checks unavoidable. Although the UK government committed to proposing specific solutions to the unique circumstances on the island of Ireland, those proposals are awaited. II – Governance of the withdrawal agreement - in order to be credible and durable, a withdrawal agreement should have effective implementation mechanisms. As far as the EU is concerned this requires a role for the European Court of Justice. This remains a point of disagreement with the UK. III – The transition period - this consists of extending the acquis for a time-limited period, as was requested by the UK itself. The Heads of State or Government of the 27 replied positively to this request at the European Council of 15 December. Points of disagreement remain. Citizens' rights: while the UK recognises that the free movement of people applies fully during the transition period, it does not want – at the end of this transition – to extend the rights, as agreed in the Joint Report, of those citizens who arrived before the withdrawal, to those citizens who arrive during the transition. Application of EU rules during the transition: the UK has requested a right of opposition where it disagrees with a new rule or law which could enter into force during this transition period. On Justice and Home Affairs questions: the UK wants to continue benefitting from new EU policies while at the same time it has decided to leave these policies at the end of the transition. 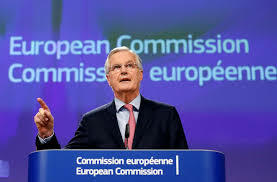 Mr Barnier commented - "By asking to benefit from the advantages of the Single Market, the Customs Union and common policies, the UK must accept all the rules and obligations until the end of the transition. It must also assume the inevitable consequences of its decision to leave the European Union, its institutions and its policies. Taking into account these disagreements, and to be frank, the transition period today is not a given." Mr Barnier's speech refers to a legal text on transition. The text was published on 7th February and may be read via the EU Commission website or HERE (pdf). This "transition document" contains a provision to allow existing EU implementation mechanisms to be reinforced during the transition period. The provision is Article X+5 - "Supervision and Enforcement - During the transition period (which will end 31st December 2020), the institutions, bodies, offices and agencies of the Union shall have the powers conferred upon them by Union law also in relation to the United Kingdom and natural and legal persons residing or established in the United Kingdom. In particular, the Court of Justice of the European Union shall have jurisdiction as provided for in the Treaties." A footnote to Article X+5 then states - "In addition, the Governance and Dispute Settlement Part of the Withdrawal Agreement should provide for a mechanism allowing the Union to suspend certain benefits deriving for the United Kingdom from participation in the internal market where it considers that referring the matter to the Court of Justice of the EU would not bring in appropriate time the necessary remedies." Mr Barnier's speech explains why the EU see this as necessary. In the event of violation of European rules during the transition, the usual infringement procedures risk taking too much time to resolve the dispute. He said, "It is absolutely normal that, in an international agreement, effective implementation and conflict resolution mechanisms are foreseen. This is the case, for example, with our agreements with Switzerland." In a post on his EU Law Analysis blog, Professor Steve Peers has considered the legal text in some detail. His comments about Article X+5 are particularly trenchant. "The proposal is then not only legally and politically questionable, but poorly thought out and justified, not only breaching the Commission’s obligations as EU negotiator but also spreading ill will in the negotiations. The phrase “frolic of the Commission’s own” scarcely does justice to the problematic nature of this proposal." Essentially, the EU Commission is asking for a situation in which the UK is bound fully by EU Law during transition but with a special rule more suited to a treaty with a State that is not fully covered by the EU Treaties. It is not at all clear what process will apply prior to the EU deciding to "suspend certain benefits." Furthermore, such action could well raise complex points of EU Law which might require resolution by the court. Clearly, over the Island of Ireland questions, Citizens' Rights and Transition there is much still to be done against a rapidly diminishing timescale. The UK leaves the EU on 29th March 2019 and there is, as yet, by no means certainty that there will be a transition (or implementation) period. A video is available via YOUTUBE in which Professor Michael Dougan discusses the problems associated with transition. If you have 20 minutes to spare this is well-worth watching. Mr. Barnier is correct! The UK government is avoiding every steps and transparency! Thank you for your clear-sighted articles on the Brexit subject. Much appreciated.